Nations Press feature GOODNEWS: OWWA and Landbank Offers Loan for OFWs-PLS SHARE! 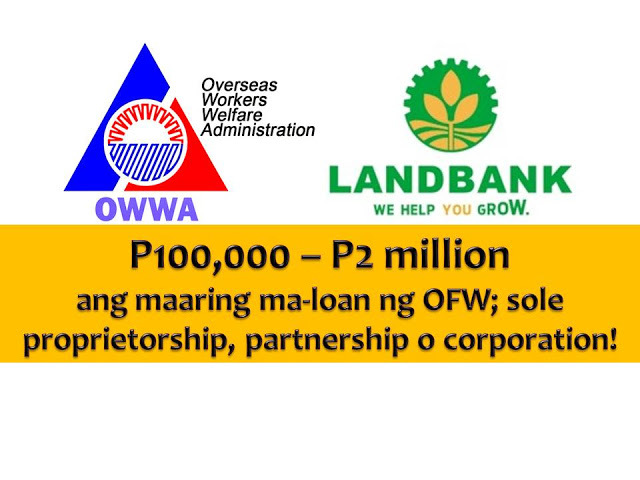 GOODNEWS: OWWA and Landbank Offers Loan for OFWs-PLS SHARE! SPONSORED LINKS Being an OFW is not a forever job, they are given opportunity through this kind of program to help build up their own dreams together with their families. A guaranteed fund of P1 billion pesos are prepared for the relaunched of its integrated program by OWWA and LBP for OFW's. Philippine Labour Attache for Dubai and the Northern Emirates Ofelia Domingo confirmed that the integration program was relaunched last week. Emirates Dominggo stated that in order to avail of this program you must be an active and updated member of OWWA. Goodnews is, even former OFWs who stayed for three years in the Philippines since re-settlement can be considered and approved. The loanable amount for either sole proprietorship, partnership or corporation has been lowered down to P100,000 to P2,000,000 from P300,000 to P2,000,000. Still, the loan is payable in seven years with a grace period of two years. The interest rate is 7.5 percent for a maximum of seven years. Within two months, the loan may be approved upon the submission of requirements particularly a feasibility study and collaterals. With this, Dominggo is calling OFWs to take advantage of the many opportunities they get while working abroad and invest it in a "well planned additional sources of income." The integration program was originally introduced to OFWs in 2010. Here's a process. It is quite a long one but worth it when your loan is approved and you can start your own business. 1. Get a certification in OWWA Office in your are saying that you are bona fide overseas Filipino worker. OWWA will require you to attend its Enterprise Development Training. This seminar will teach the basics of business and write a business plan. 2. With your OWWA certification, go to the nearest Land Bank for more information and evaluation of your project proposal. 3. You will need to submit your Statement of Assets and Liabilities. This is a document which states what your properties are (i.e., land, cars, bank accounts, etc.) and debts. You will also need to submit an Authorization to Verify Deposits and Borrowings so Land Bank can check your bank deposits and borrowings with other financial institutions to see if you’re credit-worthy.